Until recently, “public” communication tools (such as Skype, Telegram, WhatsApp) and corporate communication tools (Lync, Sametime, etc.) were separated by a difficult-to-penetrate wall. Corporate messengers have well-developed security and auditing features. They integrate well with the corporate IT infrastructure and are mostly administered by the customer. The main shortcoming of corporate messengers is their inability to include those outside of the “secure perimeter” (customers, partners, and subcontractors) in the conversation. The public tools allow anybody anywhere on the earth to easily communicate, but their utter lack of control over information streams creates serious problems for corporate IT and security departments. As a result, building a full-fledged communication environment, whether inside or outside of a company, amounts to a set of technological and organizational compromises and introduces significant risks. Given this situation, Skype for Business Server represents a new turn in the development of corporate communication tools, bringing together two previously incompatible worlds. On the one hand, this is the corporate version of Skype (previously better known as Microsoft Lync) with all of its advantages – secure channels, centralized management, Active Directory integration, Microsoft Office integration, and integration with the corporate phone system. On the other hand, it’s an opportunity to bring any Skype user – no matter where – into this “convenient” and fully manageable communication system. Moreover, thanks to Skype for Business Server’s complete integration, connecting these external users entails no risk and is fully manageable. What do I get after the launch of Skype for Business? See availability and status of your work colleagues. Send instant messages and files. Search for contacts in your corporate directory by the person’s name or title. Review your chat history and notifications on missed calls and chats. Connect Skype for Business to a public telephone network (PSTN) or corporate PBX such as Avaya Aura or IP Office, Cisco Unified Communications Manager, Asterisk and many other systems. Call forwarding and simultaneous calls to corporate or mobiles phones, ANI management. Call delegation, ability to change the originator’s caller ID, call parking and group calls. Apply dial plan policies either to the whole organization or to a certain user group. Audio conference functionality allows inviting users from the corporate telephone system or PSTN. Video conferencing supports high video resolution – 1080P Full HD H.264. Invite external participants to join the conference through a web browser. Desktop sharing, interactive whiteboard and online polling feature. Create conferences from Outlook or Skype for Business client. Schedule online meetings, review IM history in Outlook. Skype for Business supports multiple workstations and mobile devices on various operating systems, which enables you to stay connected even when you are out of office. Connect with other organizations which use Skype for Business or Lync. Communicate with subscribers from other public networks such as Skype, Google Talk, Jabber and others. Skype for Business uses secure TLS and SRTP protocols to protect your sensitive data and ensure confidentiality. Manage access to Skype for Business services using role-based access control (RBAC). – Will Skype for Business Server work for us? Does the product include everything we need (functionality and security)? Will the product integrate well with our corporate environment (both organizationally and technologically)? – Are the expenses for Skype for Business Server excessive? How much does it cost and how can we optimize our expenses? To make this barrier easier to overcome, Microsoft invites customers to use its Microsoft Skype for Business Server Start Service – an authorized service to deploy Microsoft Skype for Business Server 2015 Standard Edition on the Customer’s premises and provide practical training to the Customer’s IT specialists. To give the ability to assess the full functionality of Skype for Business Server 2015 and facilitate making a decision about the need for full deployment of the product. Your company’s specialists learn the theory and gain practical skills managing and supporting the solution, and also receive recommendations from an experienced consultant. Skype for Business Server can be deployed both using permanent licenses (in which case a Microsoft partner will help you choose the best mix of licenses and subscriptions) as well as trial licenses from Microsoft, which are valid for up to 120 days – a period that is entirely sufficient for making a decision. Delivery of a presentation and a training session to your IT personnel. Installation for large organizations (50-200 employees) – virtual environment with 24GB RAM, 180GB HDD. Connection of VOIP trunk to the corporate network or PSTN. How do we estimate the duration and price of our services? 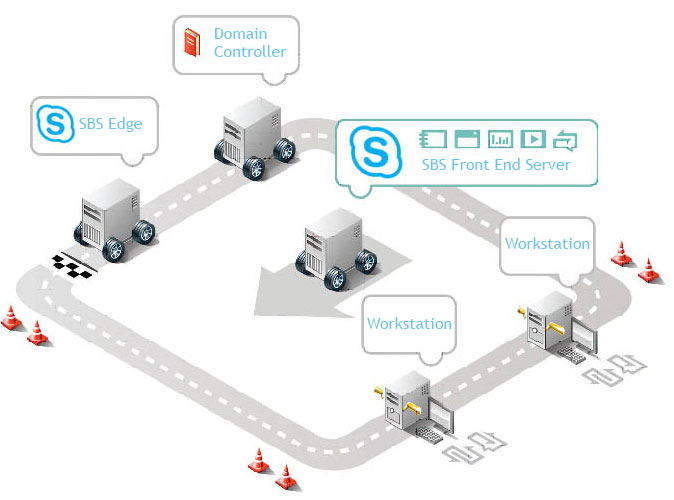 Deploying a standard configuration of Skype for Business on a ready virtual infrastructure takes approximately 2 to 5 days, depending on your configuration size. Contact us for pricing on packages for more than 50 employees and fault tolerant solutions. Our prices include one month of support and maintenance after installation. Additionally, we can help you choose the best telecommunications provider and set up connections. Contact us today and we will be happy to answer your questions. *A certificate from godaddy.com costs $100-135 per year, or use a certificate from StartSSL.com for $60 for 2 years (not supported by all devices). Why should I choose Servilon to provide the Microsoft Skype for Business Server Start Service? First, Servilon is an authorized Microsoft partner, which automatically guarantees the quality of our service. Second, Servilon is a team of IT professionals, which will support you not only while providing the Start Service but also during large-scale deployment of Skype for Business, and will resolve any problems that may arise in this process. Third, Servilon offers this service at one of the lowest prices on the market – only 1400 Euro. If our offer interests you, call us now and your Microsoft Skype for Business Server deployment project can begin as early as tomorrow. Like any other company, IT companies providing high tech services – whether software development, IT outsourcing, or remote infrastructure support – need tools to maintain adequate work discipline. A couple of days ago Microsoft released the Cloud Connector Edition (CCE) for Skype for Business Online, a hybrid solution that enables integrating your corporate PBX with the Office 365. Until recently, “public” communication tools (such as Skype, Telegram, WhatsApp) and corporate communication tools (Lync, Sametime, etc.) were separated by a difficult-to-penetrate wall. Corporate messengers have well-developed security and auditing features.